The advertisement below arrived in my email inbox earlier today. Reading it, I found myself pondering over the apparently unstoppable one-way flow of movies from the United States to Europe. We have heard much discussion in recent times about the incentives which copyright provides in order to safeguard the investment which is incurred in the production of relatively high-cost products. If such an incentive exists, what are the factors that cause investment to be made so much more successfully in US-made movies than in European ones? European copyright law is surely no weaker than its American counterpart in all relevant respects and there is now a supposedly single market for cultural products within the EU, which has a population of around twice the size of that of the US. So what is the reason why Europe buys US films but gets so few of its own distributed across the Pond? For the first time, the European Audiovisual Observatory has analysed the relative fortunes of European films released outside the EU. The report analyses the success of European films released in 10 major non-European markets as tracked by Rentrak Corporation, the international leading reference source on box office and admission. Only 103 European films had a theatrical commercial release outside of Europe in 2010. The main non-European foreign markets represent about 18% of the world admissions for European films. Outside of Europe, European films accounted in 2010 for around 3% of the total admissions, while their market share in Europe was 26%. More detailed information on the content on our website! 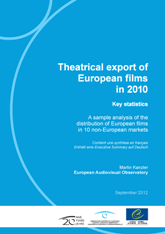 ‘Theatrical Export of European Films in 2010’ is available as a hard copy and pdf-version. To order directly, click here!